Another Monday, another sketch challenge from MJ. 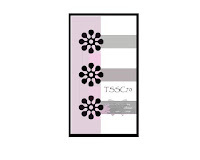 This weeks sketch is one that can be used with many stamps, because of the circles on the sketch. I decided to forgo the circles, and cut out my images to fit the sketch. 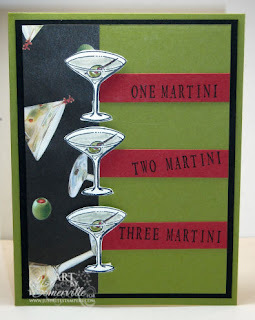 I stamped the Martini from the JustRite Girl Time Set in Black on White card stock, using the 2" Wooden Stamper. Colored with markers then cut them out, and used dimensionals to pop them up on my card. 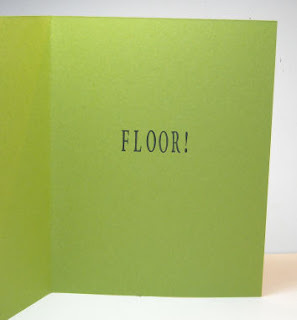 To create the sentiment on the outside, I used the JustRite Harmony Rectangular Stamper stamping in black on red card stock and the Times Roman Font (25), tilting the text using a SAMJ, for the inside using the Times Roman Font (50). What a perfect idea for this layout. Made me smile! You are too smart girlfriend. Great job and of course thanks for playing along as ALWAYS! You are my constant and I so appreciate that. What a great idea to use that saying with this sketch! A perfect match and a fun card!